Fish Aid started in 2001 when Anthony Pilcher (or "Fish" as he liked to be called) found out that he had a rare type of cancer called Osteosarcoma. Fish's first thought when he was diagnosed was that he wanted to raise money for charity. A group of pupils at Lewes Old Grammar School (LOGS) where Fish was a pupil, decided to hold a rock concert to help in the fund raising. The rock concert was named Fish Aid after Fish. Unfortunately Anthony Pilcher passed away on the 8th October 2002. 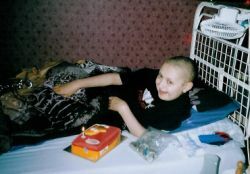 But in his memory the official charity for Osteosarcoma was set up. It was named the Anthony Pilcher Bone Cancer Trust and Fishaid is an important part of the charity. Fishaid raises money for the Anthony Pilcher Bone Cancer trust through its rock concerts, and support for Fish Aid is growing fast. TBA - join our Facebook group to keep up to date.